Layouts are a quick tool for chopping one block area into smaller block areas. We do not recommend you use them for site design or lots of pixel perfect design concerns. They're really a band-aid solution to the "Oh, I'd love to have a survey next to this paragraph of text" problem. Some installs may have the layouts feature disabled, in that case, please ask whoever setup your site re-enable it. 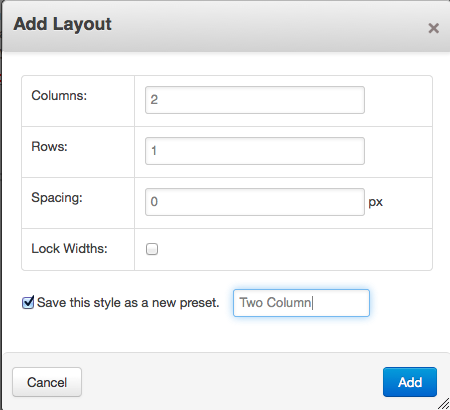 Here you can adjust how many columns and rows your layout has, and the padding space between the columns. If you did not check the "Lock Widths" checkbox then you can drag the sliders to change the width of the columns once you've created the layout. If you do pick lock widths, you can enter a pixel amount for the columns. 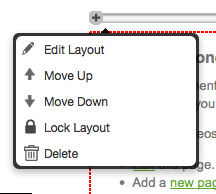 From the page in edit mode, you can click the "+" button on the left side to Edit the settings of your layout. 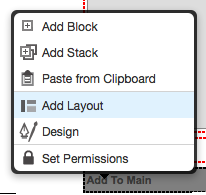 You can also lock layouts and change the sort order of the layout. When you move the layout up and down, all the content in it will go with the layout.